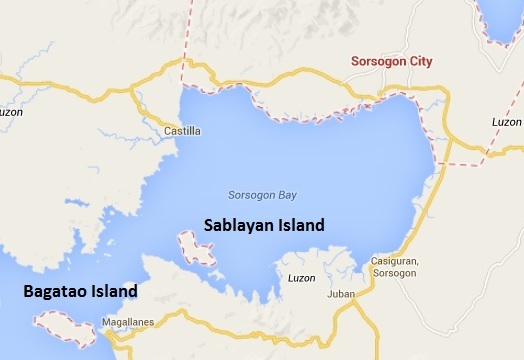 According to Wikipedia article of Sorsogon City, the islands of Sablayan and Bagatao are under the supervision of the said local government. It doesn’t mention which barangay administers the said island. Image | This entry was posted in Sorsogon Places, Uncategorized and tagged Bagatao Island, Sablayan Island, Sorsogon. Bookmark the permalink. Sablayan Island is itself a barangay of the LGU (town) of Juban, which has 25 barangays. Bagatao Island has two barangays, namely Biga and Behia, which are two of the 34 barangays of the Magallanes town (LGU). Missing in the map that you published is the island of Malaumawan that is part of the Castilla town (LGU). It faces Bagatao Island at the mouth of Sorsogon Bay. FYI. Thanks for the comment. I just took it from Google Map and will check again if somebody tagged it already. However, if you can give me a locator from another map, I could tag it in Google Map. But let me use your reference points. I have your email address and take it from there. I just checked the Google map, Malaumawan Island doesn’t exist. And after checking Google, it only shows up a single result – http://www.mabuhayradio.com/history/why-select-magallanes-town-as-the-site-of-a-world-class-movie-studio-with-a-revived-shipyard-for-making-galleon-replicas-and-sailboats.